UNITED NATIONS, September 4 -- In Turin and again in Sudan, Ban Ki-moon struck the same chord, that he is not a man of words but of results. Forget, for a moment, that his engagement with climate change to date has been nothing but words -- beyond, as has been pointed out, turning off the lights in his 38th floor office in New York. No, let us consider the results to date. Ban made much of the second, if not third, announcement that Sudan will let Suleiman Jamous fly to Kenya. In fact, at UN Headquarters on August 31, when Inner City Press asked the UN's deputy emergency coordinator if Jamous had already arrived in Nairobi, the answer was yes. That must have been wrong, because there was Ban in Sudan, saying he'd won Jamous' freedom. Add him to the British sailors in Iran, to Alan Johnston and the Taliban's Korean hostages. The results are piling up. At least a half dozen stories about Ban's trip quote an unnamed "senior UN official" on the plane providing pro-Ban spin. Who was this spin-meister? It would be inappropriate to expect or report on an answer from any correspondent on the trip. So let us inventory who it cannot be. At the Malaysian embassy on 43rd Street Tuesday night, Vijay Nambiar chatted with Palestinian Amb. Mansour -- thus, the quote-giver cannot be the chief of staff. DSG Migro and USG Barcena met Saturday night with the union, the latter providing spin about the finding of the nerve agent phosgene. Heading up the steps to 43rd Street was Legal USG Nicolas Michel, with a suitcase that he said was empty. These, then, are eliminated. Could the unnamed one be Kim, or the chief of communications Michael Meyer? Time will tell. 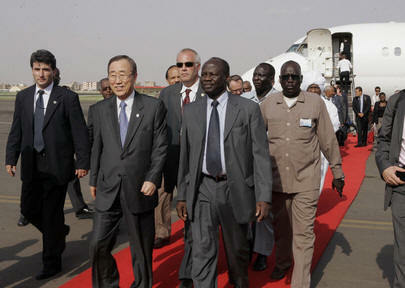 Ban de-planes in Sudan: where is the quoted "senior official"? Inner City Press: Has there been any request by either city or federal authorities to do any inspections at the UN? And if there were such a request, would the UN grant them, given what happened last week? Spokesperson: Well, the "if" questions -- as far as I know, no. There has been no request for that. I can try to get more information for you from the security services. Question: I wanted to ask about the meeting in Turin -- if we can have some kind of a readout on what -- in terms of reform -- what reforms were discussed there. And also there was this interview that Mr. Ban did with La Repubblica, where I think he was quoted as saying, this was the first retreat of senior officials. Anyway, is that the case, or have there been previous retreats on Long Island, in Westchester and other places? Spokesperson: Well, there was a retreat in Long Island, which was in Greentree, which was a very limited one, because most of the people had not been yet assigned to the different posts. So it was a much smaller one. And of course, this was a much larger one, with, as I said, about 54 participants, among ASGs and USGs. I don�t want to have our guest wait too long. So I�ll give you more about the retreat later on. Question: Luis Moreno-Ocampo was reported yesterday saying that he told Mr. Ban to be sure to raise this issue of the International Criminal Court indictees with President Bashir. So I'm wondering, was that issue raised in the meetings that he's had so far with President Bashir by the Secretary-General? Spokesperson: I don't know at this point. I can ask.